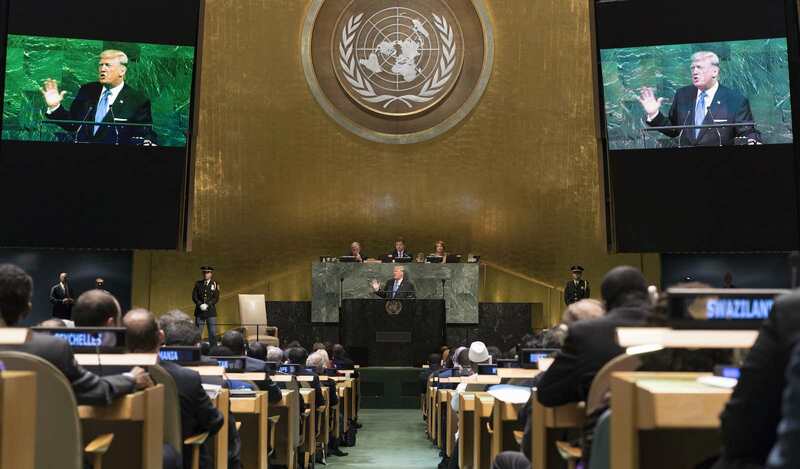 As it happens, the United States holds the presidency of the United Nations Security Council during the annual diplomatic gabfest at the UN General Assembly. Traditionally, that means the president of the US can choose to chair a Security Council meeting if he or she desires to spotlight a particular issue. Bashing Iran pleases US allies in the Middle East even as it angers US partners elsewhere and achieves no positive change in Iranian policies. Of all the possible topics Donald Trump could have picked, he apparently has settled on Iran. He intends in his 26 September appearance, according to his UN ambassador Nikki Haley, “to address Iran’s violations of international law and the general instability Iran sows throughout the entire Middle East region”. Because for the Trump administration, Iran is low-hanging diplomatic fruit. Bashing Iran pleases US allies in the Middle East even as it angers US partners elsewhere and achieves no positive change in Iranian policies. Indeed there are reports that Israeli Prime Minister Bibi Netanyahu will attend the Security Council meeting; whether Iran will send a representative is not yet clear. Iranian Foreign Minister Javad Zarif has denounced the session as “chutzpah” – Yiddish for brazen nerve. Since Trump decided to quit the Joint Comprehensive Plan of Action (JCPOA) in May, his administration has pursued a two front non-kinetic war against Iran. It consists of draconian economic sanctions and harsh anti-regime rhetoric. In his first major speech as Secretary of State, Mike Pompeo outlined 12 demands for Iran to accept to become a “normal” nation. They ranged from a termination of any uranium enrichment – allowed in a limited manner by the JCPOA – to Iranian withdrawal from conflicts in neighboring countries. Acceptance would amount to a total capitulation by Tehran and thus has zero chance of happening. Pompeo gave a second major speech in July, at the Ronald Reagan Library in California, entitled “Supporting Iranian Voices”. In it, Pompeo lambasted the Iranian regime for corruption and human rights abuses and asserted that the US supports Iranian aspirations for freedom. “The United States hears you; the United States supports you; the United States is with you,” Pompeo said. Pompeo’s Twitter account also regularly highlights Iranian rights violations and support for terrorism, while ignoring similar or more egregious actions by US Middle East allies. While ordinary Iranians might welcome some moral support from Washington for redress of their many grievances, they have to wonder about the sincerity of an administration that from its earliest days sought to make it almost impossible for Iranians to travel to the United States. Then, there are the sanctions. Re-imposed in two tranches – the first in August and the second, dealing with oil, are due 4 November – the sanctions seek to starve Iran of hard currency earnings and foreign investment. According to the Eurasia Group, Iran’s oil exports have already fallen from 2.7 million barrels a day in May to 2.1 million, and will plummet to 1.2 million by November. While there may be a minor impact on Iran’s ability to fund its support for proxies in Syria, Yemen, Lebanon and Iraq, the main victims of the sanctions are ordinary Iranians who have no easy access to foreign currency. Already, the Iranian currency, the rial, has lost much of its value, contributing to double-digit inflation. The panicked retreat of Western businesses fearing loss of US markets means that Iran will have to rely largely on barter trade with China, India, Turkey and Russia. Smugglers will get a boost and a serious effort by the government of President Hassan Rouhani to increase transparency in the financial sector may also take a hit. The private sector and middle class will shrink, and the government may resort to rationing of basic goods. The price of oil is already rising, penalising consumers everywhere. The Islamic Republic, which will be 40 years old next February, is undoubtedly going through a difficult period. Protest demonstrations have been a common occurrence since last December and many Iranians are thoroughly sick of theocratic-dominated rule. But that doesn’t mean they want violent regime change, and they certainly don’t want US military intervention in Iran after seeing the carnage and chaos in Iraq. So what will Trump achieve by highlighting Iran’s misdeeds? He has already alienated the other parties to the JCPOA. His use of the UN platform will only remind Iran deal supporters that the agreement was codified by a Security Council resolution and it is Washington, not Tehran, that is now in material breach. In bashing Iran in New York, Trump may please some members of his dwindling domestic base in advance of US midterm elections. His appearance may also boost the political fortunes of Ambassador Haley who is clearly already running for a future Republican presidential nomination, with an eye to the multiple investigations into Trump’s election and obstruction of justice in office. She has focused on Iran in previous public appearances and knows a winning issue when she sees one. To mark 100 days of the Trump presidency, we've updated our timeline of all Lowy Institute research papers, opinion pieces, media interviews and Interpreter posts.